I did the piece on living in the Toll House yesterday but I did it rather quickly so I thought I would add a few more images and bits of information. 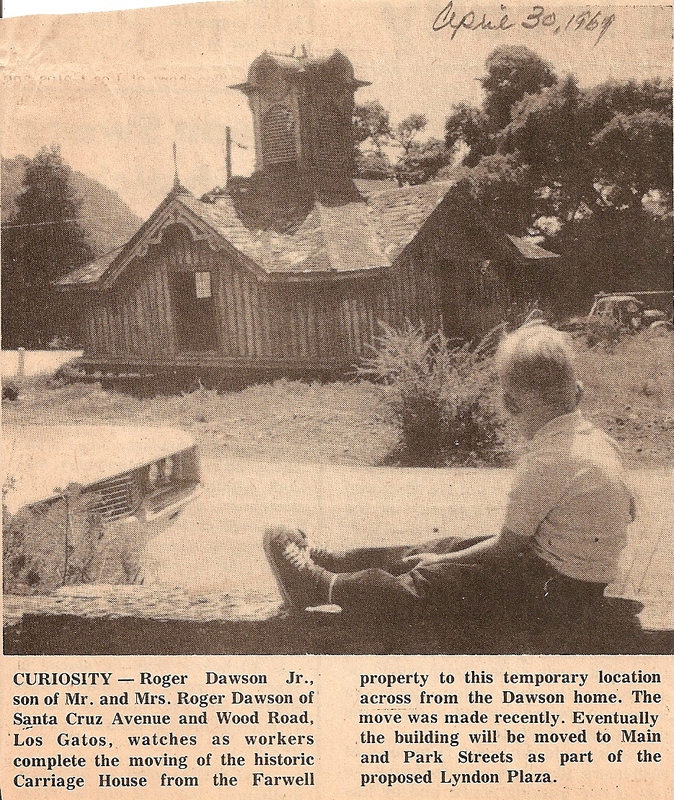 This article from the Los Gatos paper describes the process my parents went through to rent the place. We lived there during 1967 where my father worked as the display manager for the old chain of stores called the Akron. He was (and still is) an accomplished artist and it seemed like this appealed to the Planning Commission. While here my father also started and completed a Dune Buggy built from a kit he purchased from a company called Bermoco located across the bay in Berkeley. After it was built we took a memorable trip as a family to the Calaveras County frog jumping competition, made famous from an essay written by Mark Twain. It was a big trip for us and I think we camped out but I can’t really recall whether we did that or stayed in a hotel. I think it was a rally of sorts for the dune buggy club we belonged to called the Rutrunners of San Jose. The buggy was built from my mother’s wrecked VW beetle, that if I remember correctly was crushed under a fallen lamp post. That made up the base of the car and with some modifications the whole buggy was complete about 6 months later. Although it has been non-operational since the mid-70’s I still have it up at the house in Redwood Estates where me moved in 1968. I have every intention of getting it back on the road again so I can take my wife and daughter on that same adventure to the frog jumping competition which is still being held every year. On last image of the Toll House I can share is of me sitting on the wall near the street looking at the canopy of the old Carriage House. From the article you can read that the canopy was supposed to be installed at the proposed Lyndon Plaza project but it actually became the top of the gazebo across town at Oak Meadow Park. Yes, that is me indeed me in the foreground. I changed my name during college and kept Roger as my middle name. Until my late 20’s I was Rog or Rog Jr. and I still go by that with most of my old friends up on the hill. I have thought about going back to Rog but I have now been Devon almost as long so I will probably just leave it. I hope you enjoyed this peek into a more recent account of this batch of Dawson’s. I promise to get more historical in subsequent posts! The good ol’ Dune buggy! I didn’t know that the old bug was used as the chassis for it. I had never seen the clipping of you sitting on the wall. Really cool! I can totally recognize the top of that house now in the park. Great post! Thanks for the information! Those old clippings are very interesting to see. Hello Dawson. I to have a dune buggy that I believe is a Bermoco. I would like to see yours if possible and you could go for a ride in mine if you wish. When I am on my computer I will send you an email where I can attach some of the original Bermoco literature and brochure. I scanned it all awhile back and you may find it helpful. Thankfully my dad kept all of this!